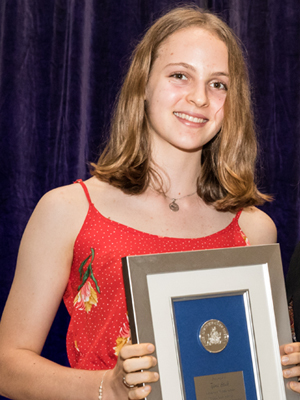 Tjina Stoll received the Administrator’s Medal for Territory Middle Years Scholar. The award acknowledged her outstanding achievement and behaviour in school, and for being an outstanding citizen and showing care towards others. The former Sanderson Middle School student said her middle school experiences have been a good introduction to high school. Moving into Casuarina Senior College in 2018, Tjina will embrace the freedoms and opportunities associated with secondary school. “You get a bit more independence – you don’t get checked up on as much, and it’s up to you,” she said. Having a balance between work and recreation was important for Tjina during her middle years’ schooling, and she continues to devote time to a wide range of extracurricular activities. While she doesn’t know exactly what the future holds, she’s happy to take her schooling as it comes. “I quite enjoy maths. And while it’s not really related, I also enjoy performing arts,” she said.